This measure was defeated – 8,130 votes No to 8,081 votes Yes! Unfortunately, the sheriff and supervisors completely disrespected this vote, and put Measure G on the November 2016 ballot asking us to vote again; unfortunately, this background information is still relevant to the unchanged project – click here for more information on the new ballot measure. No one likes crime. Still, we expect our elected officials to spend our hard earned tax dollars wisely. Going through the Siskiyou Daily News archives and other sources for the past few years tells a story of financial mismanagement, and extraordinary efforts to build the new jail, no matter what it costs, with little or no concern for state trends, the taxpayers’ dollars and or the cost of running it. In June 2016, Measure S proposes to use the sales tax – which falls disproportionately on working people – as a way to pay off high interest loans (there seems to be some problem with the credit rating) by leveraging existing assets using “non-traditional debt”. That’s not smart business, particularly when the numbers keep changing. We’re not hearing anything about the millions they are still short for construction even after the tax increase, not to mention how they’ll pay for staffing and operating costs. You don’t need an accounting degree to see the numbers don’t add up for Measure S. For 2015-16 Siskiyou County only has a $114 million approved budget (see page 10 here) so construction costs of the jail are a massive hit on county finances. Google Public Data: In 1988 Siskiyou County’s population was 42,026. It peaked at 45,030 in July 1997, then eventually declined to 43,628 in 2014 – a net gain of less than 4% for the period. Siskiyou County Sheriff’s Office: “The current Jail was opened in 1988 with a 68 bed capacity This has since been expanded to 104 beds. Our daily average population is approximately 98 inmates. We hold pre-trial felons and sentenced misdemeanor and felony violators. We are a totally self-contained facility with on-site food and medical services. Note: The first jail expansion thus increased its capacity by almost 53%. Wikipedia: Siskiyou County ranks 55th of California’s 58 counties in median household income at $37,865 (39% below the California median of $61,632). California State Board of Equalization: The statewide sales tax began in 1933 at 2.5% and grew rapidly starting in the 1970s to its current level of 7.5%. Counties, cities and districts can add to this rate. 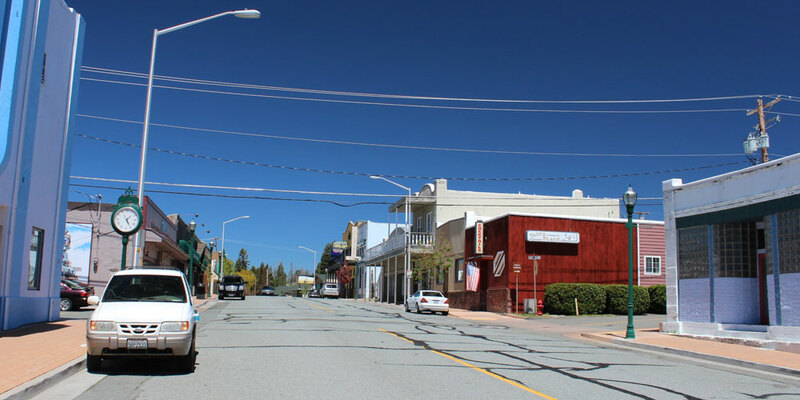 “For Siskiyou County, what that primarily means is the people convicted of things like possession of methamphetamine can no longer go to state prison. That’s the majority of what we’re talking about in Siskiyou County,” Heie said. “Drug possession cases are typically what we send to state prison more than anything else. “According to the sheriff, about 80 percent of the people in jail are awaiting trial, not serving time. That’s a main problem that needs to be addressed,” Heie said. 7/19/13 – “To contend with this influx of inmates, the sheriff’s department has been planning to build a larger jail facility. Yet, even with the additional bed space, sheriff Jon Lopey explained it won’t be enough. “We can’t afford to put everyone in jail and throw away the key,” he said. “Just putting people in jail has not worked, so we need to do something different,” said corrections officer Allison Giannini, the program coordinator. 2/14/14 – “The costs of staffing the jail are also expected to be high, according to the fiscal analysis. The document identifies an estimate of $735,000 in additional staffing for the new jail, bringing the total estimated cost just for staffing at $3,533,673 per year. 8/13/14 – “The county has received a $24 million grant from the state of California as part of the state’s effort to fund the transition of jurisdiction for certain classes of inmates from prisons to county jails…Adding in the cost of a five percent construction contingency and the estimates for soft costs, Fadness said that the county is looking at a funding gap of $7,504,886 for construction. 1/30/15 (Siskiyou Daily News) – “The plans for a new jail in Siskiyou County continue to change as the architectural firm in charge of the process searches for new ways to bring the project costs within reach of available funds. “Representatives from the firm Nacht & Lewis visited Siskiyou County Thursday to provide the county board of supervisors with an update on the new jail project, which previously had been estimated to cost $7.1 million more than the county was allotted in a state grant. “That estimated shortfall has since been whittled down to $3,698,093, according to Eric Fadness of Nacht & Lewis, thanks in part to various changes in the proposed design. 3/12/15 – “Herrick started off with the bad news, telling the board that the delay in the decision is expected to add $400,000 in construction cost escalation, and Nacht & Lewis estimates an increase in $500,000 to the project due to the complexity of the project. “She then moved on to four options identified by county staff for the board to consider. The first would be to try to fund the jail only with state grant funds, building in a kitchen and infirmary. That option, she said, would leave the county with a $9.4 million shortfall. “Excluding the infirmary but including the kitchen would leave a $5.7 million shortfall, according to Herrick, and leaving out both additions would leave the county short $2.4 million. “She added that county staff does not recommend building an incomplete facility, so a fourth option is the recommended path forward. “That option would see the county building only the jail with current funding source and competing for a separate grant under Senate Bill 863 to build the kitchen and infirmary. The county would still be $1.7 million short, Herrick said, adding that county staff were seeking direction to pursue both the additional grant and sources of funding to cover the remaining gap. “Those sources include the sale of excess county property, funds from power generation from the county-owned Box Canyon Dam and other sources, including a possible loan from the state. According to Herrick, the loan is not a guaranteed option because the financing bank has expressed concern about the county’s ability to repay due to a lack of healthy reserves. “The suspicious activity led to an investigation by the SCSO, which uncovered that the card – allegedly stolen by an inmate while the vehicle in which the card was stored was in the county yard – had been used between June 16 of last year and Aug. 15 of this year to rack up the charges. 11/11/15 – “The board met at its regular meeting on Tuesday to discuss the future of the project in light of a recent announcement that the county was turned down for additional funding under California’s Senate Bill 863. “Exploring potential funding sources to cover the gap, Barber said that the combined funding sources – from the county’s geothermal fund, the insurance payment from the theft of the county’s gold and other sources – totals only $3,033,000 if the county completely depletes them all. “Auditor-Controller Jennie Ebejer gave the board an overview of its potential funding options, narrowing the discussion to the option she believes would present the greatest chance of success – Certificates of Participation. “A form of lease revenue bond, the payment is tied to an annual appropriation and is therefore not viewed as traditional debt, she explained. “The COP option would come with costs right at the outset, according to Ebejer, who said that the process would require the county to obtain a credit rating at a cost of $25,000, and it would take four to six weeks to complete. “The COP would require that the county use as collateral a county owned facility, and that it provide a team composed of an underwriter, bond counsel and financial advisor. “If the county were to qualify for a $6 million COP at 6 percent annual interest, its estimated annual payment over a 20 year period would be $515,000 to $550,000, and over a 30 year period, $430,000 to $475,000, Ebejer said. 1/6/16 – “…With construction costs generally increasing over time, she added that the true funding gaps would likely rise to $7.5 million and $10 million, respectively. District 2 Supervisor Ed Valenzuela said that, given the numerous other issues that could crop up with an off site kitchen, he wanted to proceed with the kitchen on site. The rest of the supervisors ultimately stated their agreement, and the board directed staff to formulate the project description with the kitchen on site, bringing the current total cost estimate to $37,774,000. Barber said that the county will now be able to explore various financing options for the $10 million overage, and the board was next tasked with deciding how it would generate enough revenue to pay back a $10 million loan. Such a loan, she said, would require annual payments over $600,000, depending on the interest rate and the length of the loan repayment. As an example, she said that a 30 year loan with 5.5 percent interest would likely cost the county $681,000 per year, while a 20 year loan at the same rate would likely cost $825,000 per year. Barber noted that loans at 4.5 percent interest would have somewhat lower payments, but she said that she does not believe the county would be able to qualify for that interest rate at this point. The board in December looked at various options for creating enough revenue for the repayment, with two potential options brought back on Tuesday – a general tax measure and a special tax measure. Barber said that, based on the county’s current sales tax revenue, a .25 percent tax increase would likely bring in $200,000 annually, while a .5 percent increase would likely bring in $400,000 annually. 5/6/16 – “The figures that were presented are subject to numerous variables, but Ebejer’s office estimated approximately $1.5-1.9 million could be generated annually if Measure S ­– which would institute a county-wide half cent sales tax – goes forward. “Ebejer and Zediker detailed two primary avenues for obtaining revenue for the new jail: an IBank loan and a Certificate of Participation bond. And What Will It Really Cost? Massive jail expansion now, when the trend is away from mass incarceration, could leave Siskiyou County with a “white elephant” whose care and feeding continues indefinitely, no matter what. Changes in the law such as Proposition 47 (passed in 2014), the likely legalization of marijuana in 2016 and other measures could significantly reduce the need for expansion. Note: The polls above may not reflect all polls that have been conducted in this race. Those displayed are a sampling chosen by Ballotpedia staff. If you would like to nominate another poll for inclusion in the table, send an email toeditor@ballotpedia.org. VOTE NO ON MEASURE S!! !